The Lounge has a comfortable settee and lounge chair. There is an extendable dining table and chairs. For entertainment there is a television with DVD player, a radio and CD player. There is also a selection of books and games. The Victorian fireplace has an electric flame-effect fire with convector heater. A door from the lounge gives access to an under-stair storage room that provides ample space for outdoor clothing, hiking boots etc. Maps and guide books are provided. The newly fitted kitchen provides ample storage in both floor and wall units. 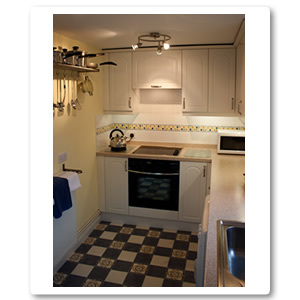 A washer dryer, fridge freezer and microwave are installed and an electric fan oven and ceramic hob are built-in. A good selection of cookware and utensils are provided. The back door from the kitchen leads up a short set of steps to a private patio with table and chairs, the perfect place to dine al-fresco and enjoy the sun late into the evening. 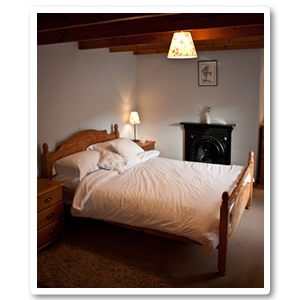 The bedroom is very spacious with original restored wooden beams. The Victorian fireplace (not in use) adds to the nostalgic feel of the room. There is a double bed with bedside cabinets. A pine wardrobe, chest of drawers and built in wardrobe provides plenty of storage space. From the two bedroom windows the views to the south over Glen Rushen can be enjoyed. The shower room is a new addition as, until 2006, the cottage did not have a bathroom. 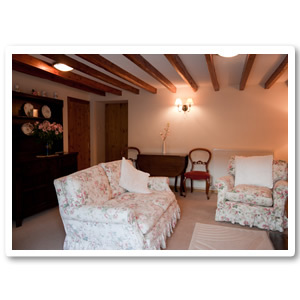 The room is fully tiled with sympathetic tiles that blend with the original beams and quaint window. 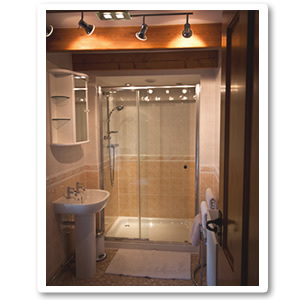 There is a large shower enclosure with extractor fan wash basin and toilet. Storage is provided in the mirrored wall cabinet that includes a shaver point.